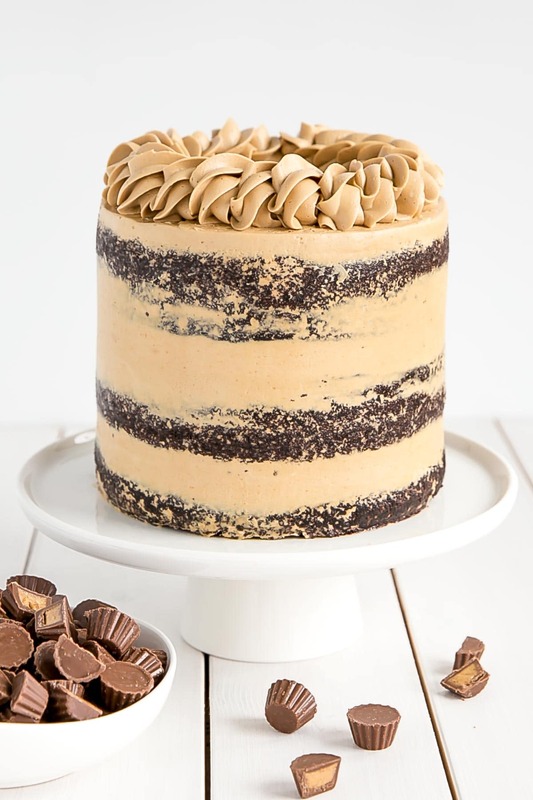 This Peanut Butter Chocolate Cake is pure decadence! 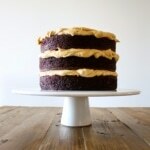 Rich chocolatey cake layers and a silky peanut butter frosting. There are few things that go better together than peanut butter and chocolate. I know some of you will disagree, but it is one of my favourite flavour combinations. In fact, one of the first cakes I ever made for the blog was this exact combination. That was a long time ago, and I like to consider this one new and improved. 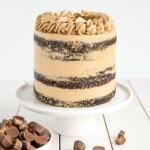 The main difference between this Peanut Butter Chocolate Cake and my old Peanut Butter Chocolate Cake is the frosting. The cake recipe is very similar, though smaller in scale – the old cake was three 8″ pans, this one is three 6″ pans – but the frosting got a complete, delicious makeover. For the old recipe, I used an American style buttercream, which was delicious, but I generally prefer the taste and texture of meringue buttercreams. They are a tiny bit trickier and a bit more involved, but SO worth the extra effort. 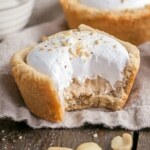 Unlike American buttercreams, which use butter and powdered sugar, meringue buttercreams use a mixture of egg whites and granulated sugar that is gently heated and then whipped to stiff peaks. At that point, room temperature butter is added and the mixture is whipped until it’s smooth and silky. And that truly is the benefit of meringue buttercreams — they are super smooth! Unlike their grainy (but equally delicious) American counterpart. They are also less sweet, but some people consider them too “buttery”. It’s really just a matter of preference. 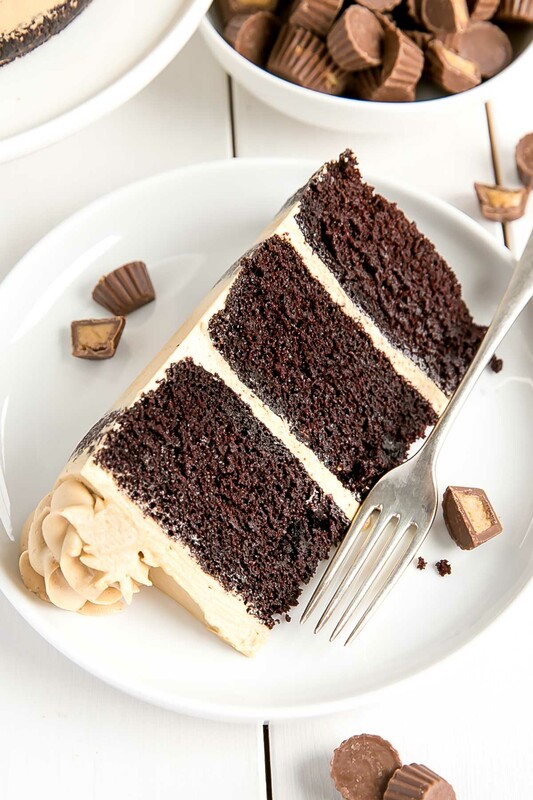 So, if you prefer an American buttercream with your Peanut Butter Chocolate Cake, head on over to my other recipe. I actually made a peanut butter Swiss meringue not too long ago, in my Peanut Butter Banana Chocolate Chip Cake. In that particular frosting, I used regular old peanut butter (not the natural kind). 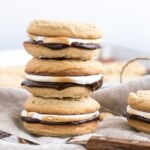 It worked really well and was delicious, but the addition of the peanut butter made the frosting softer than normal and a bit trickier to work with. 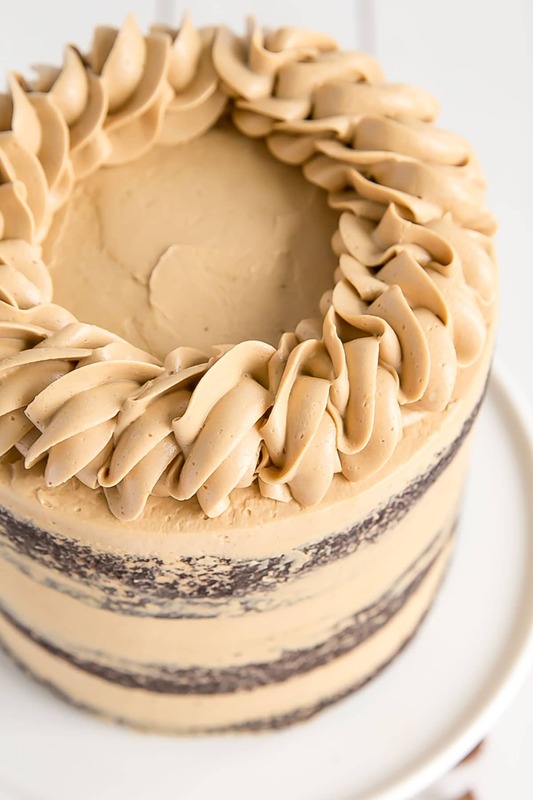 For this peanut butter frosting, I used powdered peanut butter, and it was pretty much a game changer. I didn’t even know this existed until a month ago, when someone mentioned it in my Facebook Baking group. Powdered peanut butter is made from roasted peanuts that have had the oil extracted. As such, it has way less fat per Tbsp than regular peanut butter. Once the oil is extracted, the peanuts are ground up to a superfine powder. The one I used had sugar and salt added, but you can get it without that as well. Either will work just fine. Powdered peanut butter is often used in things like smoothies, breakfast bowls, oatmeal, etc. and unbeknownst to me in baking! It can be harder to find than regular peanut butter, and is usually more expensive, but from a baking perspective it’s totally worth it. I was able to find some for a steal at Homesense, so definitely check there if you have one near you! I didn’t intend to do another naked cake with this one, but sometimes you just gotta go with the flow. I had intended to fully frost the cake and do a ganache drip before adding the decorative border at the top, but my ganache was not co-operating. I had some leftover that I had taken out of the freezer to thaw, but it had split and I didn’t have the time to fix it or make a new one. You can usually save a split ganache by reheating it and stirring it together again. If that doesn’t work, you can try adding a bit more cream to it. It usually comes together. I didn’t have the time to heat/cool the ganache though, so I scrapped the whole idea. I had already made all of the frosting, so the recipe below will be enough to fully frost the cake if you choose to do so. I decided to do a naked cake because I wanted a bit of that dark contrast that the ganache was supposed to give me. I think it worked out in the end, maybe even better than I intended in the first place, which is always nice! The technique for the decorative border is the same as I’ve done on my Pecan Pie Cake and Baileys & Guinness Cake, except I used a 1M tip from Wilton this time instead of the 6B tip. If you’d like to see a video of this technique, you can follow me on Instagram and check out my Baking Tips story highlights, or join our Baking Community Facebook group where I’ve also shared the video. 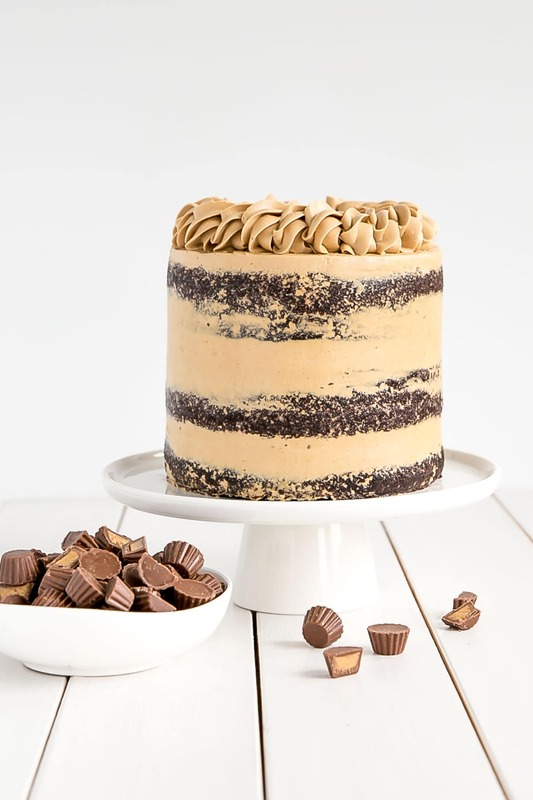 I didn’t actually use any peanut butter cups in the cake (just as photo props), but you could totally chop some up and put them between the layers and/or pile them on top. 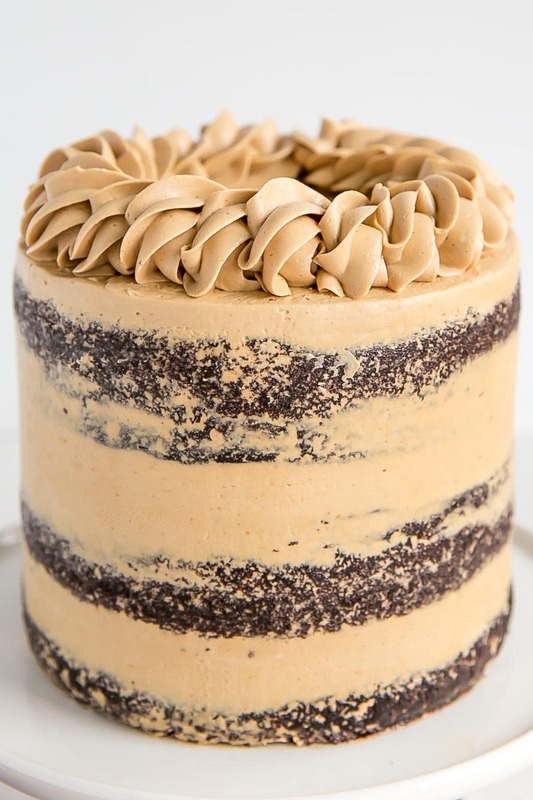 This Peanut Butter Chocolate cake is pure heaven. The cake is moist and delicious and the frosting is just the perfect pairing. 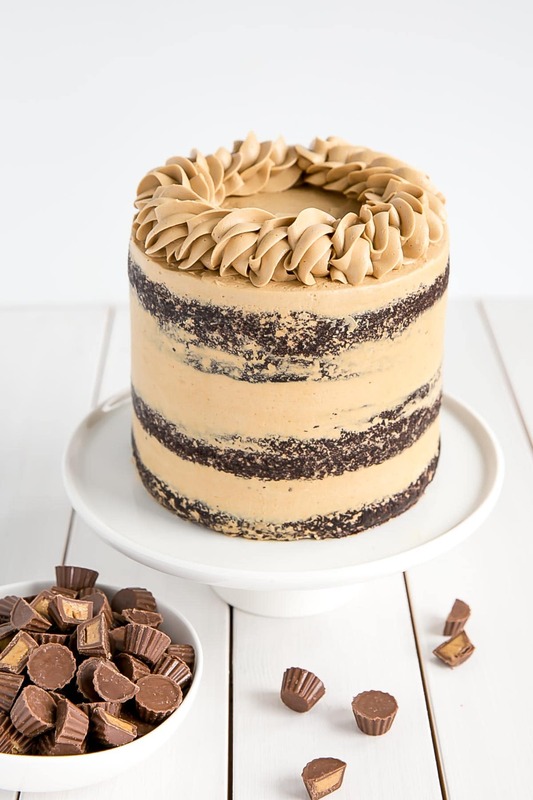 If you have a chocolate peanut butter lover in your life (pretty sure everyone has one of these), this cake is sure to be a hit! This recipe will also work in two 8″ pans, though the layers will be slightly thinner. If you don’t have powdered peanut butter you can use regular peanut butter and make the frosting from my Peanut Butter Banana Chocolate Chip Cake. I added powdered peanut butter to the cake batter too, but I didn’t find that it had a huge flavour impact so I put it as optional. You can add chopped peanut butter cups, or chopped peanuts between the layers if desired. This recipe makes enough frosting to fully frost the cake if desired. 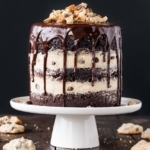 This Peanut Butter Chocolate Cake is pure decadence! 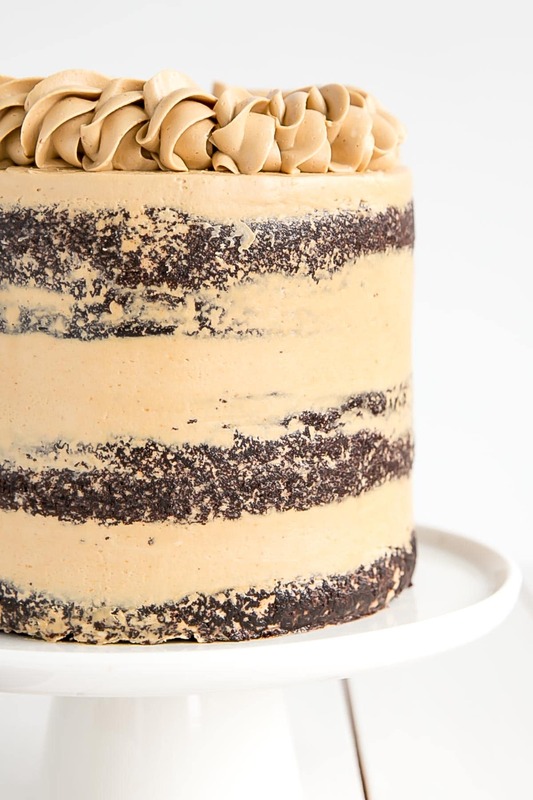 Rich chocolatey layers and a silky peanut butter frosting. In a medium bowl whisk all wet ingredients (pour water in slowly as not to cook the eggs if very hot). Bake until a cake tester comes out mostly clean. A total of 35-40mins. Place bowl over a hot water bath on the stove and whisk constantly until the mixture is hot and no longer grainy to the touch (approx. 3mins). Or registers 160F on a candy thermometer. Add powdered peanut butter & vanilla and whip until smooth. Place one layer of cake on a cake stand or serving dish. Top with about 2/3 cup buttercream. Repeat with remaining layers. Frost and smooth the outside with a thin crumb coat (thicker on the very top). Chill for 20mins. *** This recipe makes enough frosting to fully frost the cake if desired. Hi! 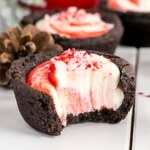 For the chocolate cake batter, could I use plain unsweetened cocoa powder instead with the same measurement? For some reason, I can’t find Dutch processed cocoa powder at the stores near me. I want to make it this weekend, so ordering some online isn’t an option for me. Thanks! Hi Ela! Plain cocoa powder should work just fine — it will affect the color and flavour, but just slightly. Let me know how it turns out! I’m in the process of mating the cake, however, the frosting is a little thin and needs thickening up, how do I do that? The frosting is delicious and very easy to work with, however I can’t seem to get it as smooth as yours. It seems like there are tiny air bubbles that pock the surface. I tried working some of the bubbles out before frosting. Any thoughts or tips about this? – Use light pressure when using your scraper to smooth out the sides of the cake. Pressing harder seems to cause more air bubbles to show. Thank you, I will try all those things next time. The merengue whipped up beautifully. It was after I added the butter it changed. Can the butter be to soft? And can you overmix the buttercream? The cake was delicious! All the recipes I’ve tried from your site are delicious. I always look for recipes that are for 3 6” pans because they are the perfect size for us! Hi! I dont have a mixer with a paddle attachment. If i continue to use the whisk attachment while making the buttercream, will it not work properly? Hi Jenn! It might just be a bit harder to incorporate the butter, but it should work fine. The buttercream has a weird texture. Any suggestions? Hi Melissa, can you elaborate? What is the texture like? Hi I’m new to making this type of buttercream. It doesn’t say where to add the vanilla. I’m assuming after you have the butter incorporated? Hi Michelle! My bad and good catch! You’re correct that you add it after the butter, with the pb powder. I’ll update the recipe. I made this for my birthday last weekend and wanted to thank you for the recipe. I had intended on trying your Milk Bar recipe but wasn’t able to get everything in time, and to be honest there were a number of other recipes of yours I wanted to try…this did not disappoint! I especially enjoyed that you included that the buttercream might look off for a while because I was able to keep going without panicking since I remembered seeing that point. I’m trying your tiramisu cake next for my sister’s birthday this weekend – I bet it will be great. Hi Meghan! So glad you tried this one and liked. I hope you love the tiramisu cake too! If I make this cake on a Wednesday but don’t serve it until that Friday will it still be good? Also, how should I store it for that time frame? Hi Shelby! Yes that should be fine. Just store it in the fridge and take it out 2-3 hours before serving. Hi Olivia, do you think if I omitted the cocoa powder and added 1\2 cup more pb powder it would work? I’m looking for a good pb cake using powder and can’t find one. Hi Kelly! No, I wouldn’t do that with this recipe. 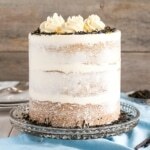 I’d recommend starting with a vanilla cake base (https://livforcake.com/vanilla-cake/) and dissolving the pb powder with the milk. Flavour wise it might require some experimenting to get it strong enough. Oh, my goodness! LOVE your rope technique! Just beautiful. 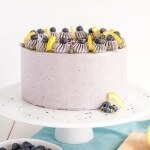 I would like to make this cake for my friends birthday tomorrow but dont have any powdered peanut butter available , can I instead use smooth peanut butter in the cake ? Hi there! 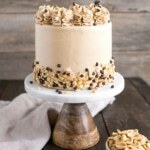 I used a smooth pb in this recipe (https://livforcake.com/banana-chocolate-chip-cake-peanut-butter-frosting/) and it worked fine. The frosting will be quite a bit softer though! Hi, made it today and have no idea what happened but my frosting “separated”. It was nice and stiff but as soon as I added PB powder it became “watery”. Do you have any idea what i did wrong? Hi Yulia! I’m not sure, usually that’s due to temperature of ingredients. If you keep whipping it it should come back together! Should any adjustments be made if omitting pb powder in the cake batter? 1/4 cup soaks up a lot of liquid so I worry think the texture will be different without it. Hi Robin! Nope, just leave it out. That’s my standard chocolate cake recipe, I just added some pb powder for flavour! 1. The meringue buttercream is so silky smooth but I wanted more peanut butter flavor. I ended up adding a pinch of salt and more PB powder noting that the texture was getting a bit gritty as I added more. 1/4 Cup more was fine. 2. To enhance the chocolate flavor I added a little instant espresso to the hot water in the cake batter and added dark chocolate chips to one layer prior to baking. Hi Seema! So happy to hear that you liked this one and thanks for the details on your adjustments! I love the addition of crushed roasted peanuts to the top. Just a note to let you know that Costco has the peanut butter powder. Super excited to find it there. Cannot wait to give the Chocolate Peanut Butter Cake. Thank you for the recipe. I’m sorry, but I’m technically challenged and cannot find your tutorial on the decorative border for this cake. Can you tell me where I go on your Facebook page to find it? Alternatively, I’m happy to email it to you! I also have it on my Instagram Story highlights.